The easiest way to understand passive applicants is to think of your range of job candidates comprising a straight line. On one end of your line, you have your passive applicants which are called “passive” because they don’t invest any time or energy into hunting for jobs. On the other end of the spectrum, you have your active applicants. These individuals are “hungry” for work and are actively seeking employment. To build a corporate recruiting plan that has the most potential for success, you’re going to need a strategy that targets passive applicants. In the recruiting spheres, it’s common to use a fishing analogy to differentiate between your passive applicants and your active candidates. Active candidates can be relegated to fishing in a pond: here, you’re going to have a lot of bites, but there’s also a lot of competition encircling you because ponds are relatively small. Passive applicants on the other hand can be compared to fishing in the ocean – although it may take longer for you to get bites (and you likely won’t get near as many as you do in a small pond), the ocean is a vast place meaning you won’t have to fight for every fish that bites. Now, I’m not suggesting that you abandon your pond fishing strategy in favor of a passive applicant centered approach, but rather that you take a moment to consider whether or not you have a strategy in place that helps attract passive applicants to you because it helps you have a more balanced recruiting strategy. The more balanced your recruiting plan, the easier it is for you to fill openings with quality applicants regardless of how they’re classified. Also, if you’re like a lot of our clients, then chances are, you didn’t even know that there were two distinct categories for candidates to begin with which severely limits your access to a wide range of high quality applicants. 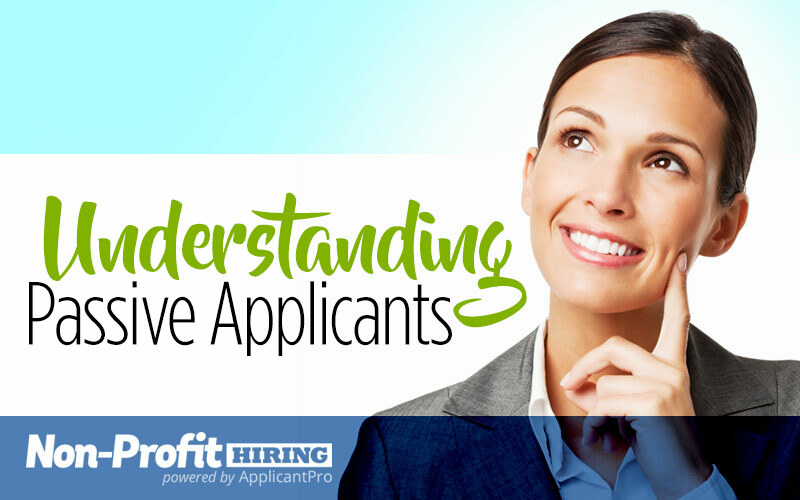 Okay, so you have an idea of what it means to be an active versus passive applicant, but you’re probably wondering what passive applicants have to offer that your active applicants don’t – well, the easiest answer to that question is that they don’t need you, but instead discover that they want you. This is a completely different approach and it’s a hot topic of discussion in the advertising industry. To be a successful advertiser, you don’t want to force your opinion of your product on your consumers, you want them to realize (on their own) that you’re what they want. There are all kinds of approaches for doing this, but for simplicity’s sake, what you want to do is plant a seed, but you don’t want to do anything with it. You let the potential customer do what he/she wants with it and if you’re an efficient planter, they’ll connect the dots on their own and interpret their thoughts as something intrinsically driven by themselves. It’s pretty much inception, but with marketing tools. The reason it’s so effective is that it removes threat and the need to get over the “trust” barrier in order to sell someone a product. The same idea holds true for passive applicants. Because they aren’t actively searching for employment, they likely won’t have multiple offers on the table in which you need to compete with to get them to commit to your company. Additionally, attracting passive applicants to you helps give you a retention insurance policy since these individuals aren’t desperate for employment. They already have a stable job and you were simply an opportunity that fell into their lap which is a completely different scenario than a job seeker desperate to pay his/her bills willing to accept anything until the next (better) opportunity comes along. Ready to revamp your recruiting strategy to include passive applicants, but don’t know where to start? Our hiring consultants can help! Call today to schedule your free consultation.